"We have had a fabulous few days performing this wonderful script! The humour is great, and the songs very catchy and easy to learn. Would thoroughly recommend." "We have just done this as a whole school musical and it was amazing! The children loved it, the parents loved it, even teachers were laughing at the jokes! I would certainly recommend this to anyone looking for a fun musical!!" "I've been putting on musicals with my year sixes for 10 years now and this is probably my all time favourite. Rehearsals never got boring and were always full of laughter. Jokes were close to the knuckle which the children really enjoyed delivering and hammed up their delivery to perfection - they had the audience laughing through both shock and laughter. The children blew the audience away with their singing because they just loved the songs (particularly 'He Will Be a Hero'). Loved it!" "This was the best production I have ever seen in 14 years as a T.A .The songs were uplifting ,the script hilarious.The audience were roaring with laughter.The children were amazing and it certainly brought the best out of them.The quality of singing and dancing was superb. All were able to take part and a few could make a future career in the business! Great buy it for your school." "I have just finished two shows and I can truly say the children were amazing! It was funny, lively, really brought out the children's talent and most of all the children loved taking part. The songs were really catchy and both the staff and the children have got them going 'round and around' in their head. The jokes were cheesy but just the right amount and the audience loved it!! Thank you - keep writing!" "Absolutely Brilliant! !- The best production I have done with the children, by far. Parents reactions where fantastic. Grabit and Bolt with such dry slap stick humor. Maid Marion in charge - go go Marion!! Rehearsals were a dream with the catchy songs, the humor and all the assistance from "Sing it!" and "Dance it!" Please keep writing - thanks Craig and team for all your efforts." "This play is just amazing! I have loved it all the way through! I love the comedy of RobinHood and the Sherwood Hoodies. I play Maid Marion, and quite enjoy it. My favourite scene is every single one! I honestly can't choose! " Alyssa, Ellen Stirling Primary School, Perth, WA, Ellenbrook. "This is a great performance, it is so good my favourite song in it is Singing all over the world. " "This show is great. I have loved it I am going to perform it soon.I love the song helping hand and Sherwood forest. My teacher Mrs Allen and Mr Harper love it and so do my class mates particularity Emma she loves it she told me she has been practiced a lot. every one loves it has a part for every one I think it is brilliant. " "Just performed February 2015. Great show. Parts for everyone to shine, even if only a few lines they have a character. Songs are brilliant and not too samey as others. Have now performed all but zoom and splash. This was our favourite. But they have all been fantastic for the junior age group and keeping everyone happy. All the notes, line counts are spot on. Thanks Craig and please write more. How about doing some for infants rec - y1 35 min plays as not much out there!" "Hello my name is Dylan and I was taking part in your play, and my role in the play was one of the two stupid spies; Grabbit and Bolt. I was the stupidest, I was Bolt. Hello my name is Jenna and I'm Dylan's partner writing this review. I was a villager in your play which is Robin and the Sherwood Hoodies. I rated this fabulous, hilarious and entertaining play 5 stars because it was written by a matching amount of quality because it was established and published by an talented writer which made the play way much better. Also when we preformed this spectacular play we made some parents cry with our singing. My favourite song is (Merry Men In Tights) because we came up with some actions with the song as well, which even made it more fun, but all together the spectacular play is the one of the best I've ever done. My, favourite scene is scene 5 because me and my partner in the play which is Grabbit, and the Sheriff of Nottingham plan to capture Robin Hood, but we made a mistake and because Marion was talking about Robin Hood we thought that she was Robin.My favourite scene (Jenna) is 7 because Nursie runs then she makes farting noises and everyone laughed. My favourite character was Nursie because she was really good at the acting that she had to do to stay in role as Nursie, also some of her jokes were quite hysterical, and I busted out laughing. Please write more plays just like this." "I was Nesbit Norman and I was Nigel Norman. I thought that the script and the jokes were excellent. Our favourite song was 'Men in tights' because it was a fun song to dance to. Our favourite scene was scene eight because everyone is together and it is adventurous. Our favourite characters were Grabbit and Bolt because they are crazy and stupid characters. We thought the play was AMAZING!!! We absolutely loved having a role in it the play. We are so glad we had this Christmas concert - this is the best Christmas concert that KS2 had ever done. We hope you write more crazy concerts. We liked the part when Nursey farted. I liked the part when the Sheriff fell into the squisher and also when Bolt said "yes we're a pair of knickers". Thank you for writing the script and the play we enjoyed it very much. " "Hello my name is Danielle and I played Genghis in your play Robin and the Sherwood Hoodies. Hello my name is Freya I played Gladys of Gisborn . We think that your play is amazing, entertaining and funny. Our favourite song is 'Men in tights' because it is exciting and enjoyable to sing and dance to. Our favourite scene is scene seven because of the farting sound effect with Nursie and Will. Our favourite characters are Grabbit and Bolt because they are funny and amusing characters to play. We strongly recommend this play to other schools. Thank you for writing this fantastic play." "Hello my name is Katie and last night we did the most exciting play ever. It was called 'Robin and the Sherwood hoodies'. I played the wonderful Maid Marion. I thought that this play was suitable for not only children but also for adults because they loved the jokes especially when 'Nursie gerty gusset' ran on stage and loads of fart noises were made. My favourite song was 'He will be a hero' because I got to sing a solo part. My favourite scene is scene 6 because Grabbit used a gold plated bonker and whacked me on the head with it, I fell into Grabitt and Bolt;s arms and they carefully dragged me off . Hello my name is Malea and I took part in an AMAZING play. I played the role of Alan a dale one of the Merry men. I enjoyed it very very much because it is such a funny play , I loved all the jokes but one in particular it was "yes we stole a calendar , yeah we had six months each" . My favourite song was 'singing all over the world' because I thought the harmonies were really entertaining and our audience loved it . My favourite scene was scene two because me and the Merry men had to dance and sing to a really fun song. My favourite character was Bolt because he is so funny to watch. This character was played by my friend Dylan and he played it really well and he was really fun to watch . Honestly I loved it and I would do it over and over again if I could and for you to write this play you must be really talented." "Hello I am Ryan and this is my friend Aiden. Last night I played the role of Robin Hood in the play Robin and the Sherwood Hoodies and might I say what a thrilling experience it was. I am Aiden I played a guard it was really magnificent. Men in tights was our favourite song because I (Ryan) had a solo in it and it had actions to go. Our favourite scene was number 8 because Will hit the sheriff on the head with a gold-plated bonker and got squished. Also I won an Oswald because King Richard gave one for being a really good actor. All in all our favourite character was Nursie Gerty Gusset; she had really funny jokes ( and a bit of gross humour ). We think this is the best concert we have ever done and would absolutely love to do this glorious performance of a life time again." "Hello our names are Tilly and Molly. Our class has enjoyed performing Robin and the Sherwood Hoodies. Our parts were Dancing Dave and Guy. We believe that it is a truly wonderful play. Our favourite song is "Men in Tights" because it's a really fun song. Our favourite scene is scene six because it shows the Merry Men are heroes not thieves. Our favourite characters are Grabbit and Bolt because they have the best jokes and they are foolish. This play has an amazingly well written script. We love this play. Our favourite joke is "I have not been so shocked since I put the electric blanket on the water bed". This is by far the best play we have ever performed." "Hello my name is Keegan and I played a guard in your well known panto Robin and the Sherwood Hoodies, and my friend Ellis played the Sheriff of Nottingham. Our favourite song is Singing all over the world because we liked the three part harmony. Our favourite scene is scene eight because we had a cardboard cut out of Ellis in his costume so when he fell into the squishier Grabbit and Bolt could pull him out. Our favourite character is Nursie because of the farts! We thought that the overall panto is exciting, enjoyable and enchanting. Thank you very much for writing this amazing panto Bye." "Hello I'm Gracie and I am Ryan, this year I played King John and Ryan played Inkhorn in our school play Robin and the Sherwood Hoodies. We loved this year's play because there's a mixture of goodies and baddies. The jokes are hilarious and they made us giggle throughout the play. My favourite song has to be Men in tights because all of the Merry Men are on stage singing and dancing and the people on the sides are doing a dance routine , (that one of our teachers created.) Our favourite scene is scene 7 because Nursie was walking and the floor was creaking and then she started running. The face she pulled was so funny we could not stop laughing .The character I liked the most was Big John/ Little John because of the voices, one loud voice, and one squeaky and I liked it because it was different. I'm Ryan and my favourite character was King John, because he actually acted like a real king. We recommend this play to many other schools as our school enjoyed it loads!" "We both enjoyed playing in robin and the Sherwood Hoodies. I [kaiden] was a guard. I really liked the first scene where we introduced the Sheriff of Nottingham. If I had to pick my favourite character it would be Nursie because she had lots of jokes making me laugh my socks off. I thought this play was amazing with all the funny scenes and silly jokes. My favourite song was Merry men because we had a dance to go with it. I really liked this play and I really recommend this play to other schools. I [Eleanor] was Nursie and I loved all my silly jokes [especially when I ran across the stage]. I must say though if I had to pick a character it would be Nursie as well. I thought this play was outstanding with all the hilarious jokes and crazy costumes. My favourite song was Singing all over the world because of the final part were everyone sang in groups and it sounded beautiful. My favourite scene was scene seven where Nursie did the trumping across the stage because it was really funny. I really recommend this amazing performance to other schools. " "Hello my name is Chloe this year my class did a play called Robin and the Sherwood Hoodies. My character is called Grabbit. I enjoyed this play a lot. I found it enjoyable, exciting and hysterical. I had a partner called Bolt. He was amazing at acting and had lots of jokes. My favourite song was 'Merry men' because it was our finale song and had a dance routine. My favourite scene was scene 3 because that was when all the hysterical jokes happened. My favourite character is Nursie she was funny. Hiya guys my names Leah I played Gavin Gutwrencher. I thought it was the best play our school has ever done. I enjoyed all the laughter in the play but some people were laughing when the parents were laughing. My favourite song is 'Singing all over the world' because there was a 3 part harmony and it went really well. My favourite scene was scene 7 because well firstly I went on and took Marion to the dungeon but the best part was when Nursie was running round and it made lots of fart noises. My favourite character was Robin Hood because he was excellent and he had a lot of fun on the stage and didn't forget any of his lines. Robin Hood was an interesting character. Well everyone enjoyed it and every pupil learnt their lines and enjoyed it themselves. Our finale was the favourite for everyone else because almost everyone was on the stage for the last scene and they were on the stage for the finale so thank you for the play. Chloe and I recommend it for other pupils and schools. I hope you write more plays for everyone to enjoy and have a laugh. Thank you very much." "Hello my name is Cameron and I played Friar Tuck and my friend Natasha played King Richard in Robin and The Sherwood Hoodies. It was one of the best plays ever. We adored the song 'Men in Tights' because it was very catchy. My favourite scene was scene 8 because the Sheriff of Nottingham got squished. My favourite characters were Grabbit and Bolt because they were very funny. I really liked this play and I wish I could do it again! " "This year the juniors preformed Robin and the Sherwood Hoodies; it was exciting, entertaining, and funny. The jokes were hysterical. The parents laughed at most of the jokes. Caitlin was Bodkin and Cassie was Big John/Little John. Our favourite song was "Men in Tights" because you can do silly dances and you get to whisper a chorus. Our favourite characters are Big John/Little John and Bolt. We liked Little John because he has a squeaky voice and can be funny. Big John was good because he wants to be as good as Little John and Bolt because he has loads of jokes to say. Our favourite scene is scene 7 because Nursie keeps making noises when Will told her to be quiet. 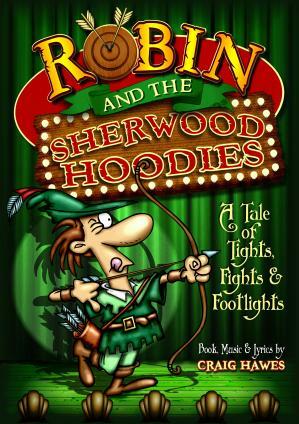 Craig Hawes is a spectacular pantomime writer, we hope he will make more pantomimes because our children and parents loved Robin and the Sherwood Hoodies. The script was full of jokes especially Bolts jokes "
"The best play ever should of bought it much sooner;great performance defiantly get this!" "This is written in true panto style and I have seldom seen a profession panto which is more entertaining In the writing. This has practically a laugh a line and is very sophisticated and well written, considering it is a play written for children to perform. The adult audience loved it and also a 7 year old said she liked it so much she wanted to see it again, and was it on You Tube! Our play ran for an hour. We also used 1920's costumes. The songs are great and I keep singing them.... I can even remember the ones from last year's "Pirates' of the Curry Bean" - Craig Hawes, we need more please!" "We have just finished two showings of this play-I think it's the best we have ever done. Like a real panto-plenty of jokes, lively characters and superb costumes-with lots of tights!! The children and staff have really enjoyed it, as have the parents. "